I've had these photos from my wedding in our room forever with no frame! I took it once to get framed at a craft store with a 50% off coupon and she quoted me over $100. it's time to do something about this. And now my mat and pictures have a frame on top of the armoire in our room. Thursday= DIY day at Kimba's! Love your blog, by the way! I visit often! Great eye! I so often am too focused on the picture itself and not the frame. Wow! It is just gorgeous. I'm with you on having things framed...really? Love what you did with the spray paint. Looks great! In a moment of generosity, I've decide to let someone else have that lovely palm! That worked out well! It looks great white. I was at the craft store this past weekend and decided to ask about a piece of glass, for a $24.99 print that I broke. They wanted $40.00 for a piece of glass that was about 16 x 16. I could just buy a new picture! oooo - i like your version much better than the palm tree thingy. I need start crackin on the old accessory issue at my house. That is terrific! Just goes to show you that if you have enough patience, you can find just the right thing! Nice job. I'm planning on trying spray painting a few things this weekend. I'm having trouble finding Heirloom White paint. Can you tell me the brand, and where you buy it. Also the satin black too. Oh man! I never thought to decorate the top of our armoire! Now I'm off to find the perfect accesories! Jan~You can find Heirloom White at Home Depot. It's Rustoleum "Painter's Touch" brand and I usually get it in the satin finish. They also have a great satin black. Good luck~hope you can find it! Thanks for coming by Its So Very Cheri. I hope you will come by often, leave lots of comments and become a follower, I already follow you. A wonderful tranformation. 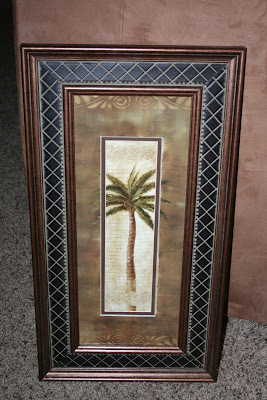 I love the way you are using a frame holder instead of simply hanging it on the wall. thanks for sharing. 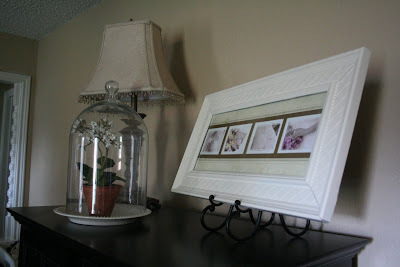 What a thrifty solution for framing your pictures. Thanks for sharing! Looks gorgeous, and now so special. And what a steal at $3!! P.S. That pic of your baby in the basket is beyond precious! 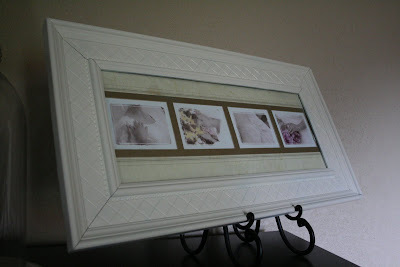 Whata terrific idea and such a practical and helpful way to frame such treasures in nice inexpensive frames! I have ton of pictures piled becuase I'm always on the hunt for afordable frames. Thank you so much! Great makeover and great vision. Love when you can find something that fits a needs so perfectly. Thinking outside of the box....it looks super....thanks for telling us where to buy the "HEIRLOOM WHITE" paint. Wow! It's the reverse of the saying, "It's what's inside that counts." Ah, much better! It looks great and I love the price tag! Everything you touch turns into beauty! $3 beats over $100 any day of the week! 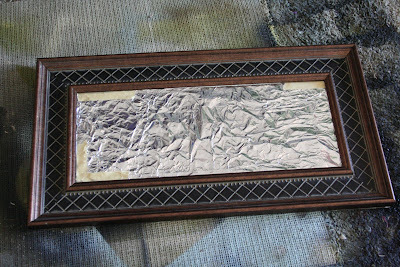 I love the texture of that frame too. You did it again Melissa! Love it all. ooo looks great! i just did a chair makeover. come by and take a look! What a wonderful idea. I'm going on a frame mission this weekend. Beauty! 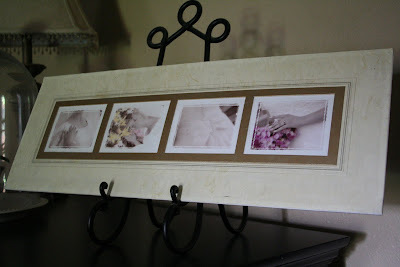 The frame looks so striking holding your pretty wedding photos.